How do you ensure that something stays cold or warm – with very limited space? va-Q-tec is a young, medium-sized high-tech company that has been pioneering the development of innovative solutions in the insulation industry since 2001 on the basis of energy efficient, space saving and environmentally friendly vacuum insulation panels (VIPs). 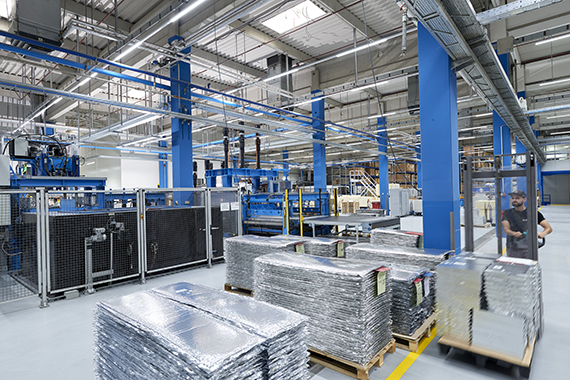 In addition to VIPs, va-Q-tec develops and sells other products such as high-performance thermal packaging and airfreight containers as well as heat and cool storage elements (PCM). The efficient technology of va-Q-tec products saves expensive energy costs in areas of everyday use: in the transport of pharmaceutical products, in refrigeration and freezer appliances, buildings, technology & industry as well as in automobiles and aircrafts. Continuous improvement of our structures and auditing of our quality management, energy management and environmental management in line with ISO 9001:2015, ISO 50001:2011 and ISO 14001:2015 help us to successfully manage our constant growth and to remain true to our high standards for products and customer service. va-Q-tec’s vision is to increase thermal energy efficiency worldwide. Our space-saving and efficient products save cost-intensive energy in areas of everyday use: refrigeration and freezing units, transportation of medication, automobiles and aircraft, buildings as well as in technology and industry. For over 15 years, va-Q-tec has been furthering different industries through the use of innovative and environmentally friendly VIPs and contributing to innovation and sustainability. Our objective is to make entire power plants obsolete through worldwide use of va-Q-tec’s vacuum insulation panels which help decrease energy consumption. The core material of our vacuum insulation panels can be collected and recycled. The material of the core board, micro-porous silica acid powder, is a precious raw material which can be reused after reprocessing, e.g. for producing a new vacuum insulation panel. The powder board can also be disposed of in a suitable disposal site if necessary. The high-quality casing can be disposed as with any other packaging film, e.g. for use as fuel.